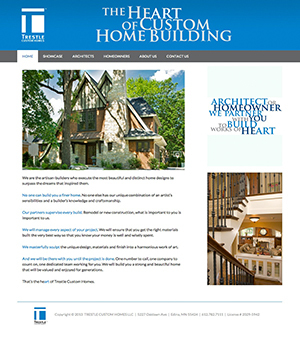 Luxury home builder Trestle Custom Homes engaged one of our extended team members, John Currie, to create the look-and-feel of a new website and Innov8Press made John’s vision a reality. Prospective home buyers are obviously a key target for this site, but with high-end custom homes it’s the architect who most often chooses the builder. Providing enough information was critical but also building their SHOWCASE was key so people could see what this builder of beautiful homes could do for them.